Radiation therapy is a form of cancer treatment that uses an intense form of energy, called ionizing radiation, to damage or destroy cancer cells. Ionizing radiation harms cancer cells' genetic material. This kills the cells or interferes with their ability to grow and multiply. Normal cells near a tumor can be damaged as well. However, normal cells can repair any damaged genetic material, so they often recover and survive. 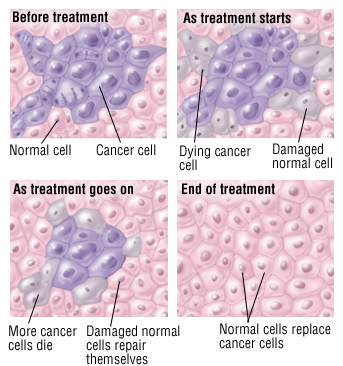 Cancer cells generally can't make such repairs, so they die. Radiation therapy can be given externally in the form of x-ray beams, gamma rays, or beams of subatomic particles such as protons. Treatment with external radiation is usually painless and takes five to 15 minutes per session. The number of treatments varies for each person. In some cases, therapy may take place almost every day for several weeks.